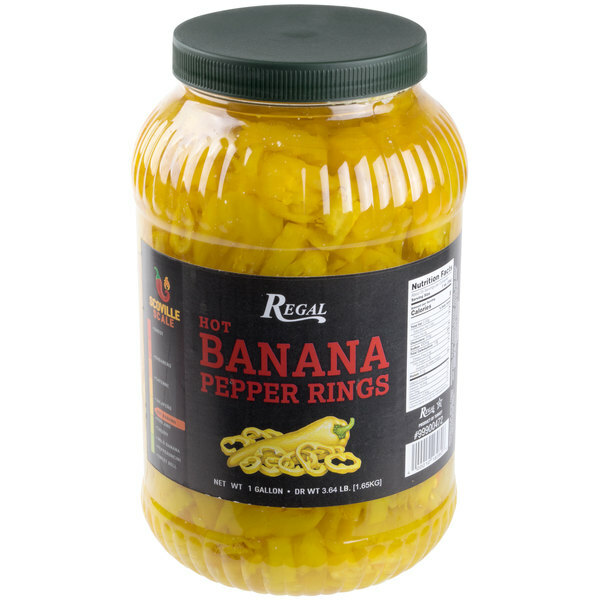 Look no further for a zesty topping or ingredient to enhance your flavorful meals than these hot banana pepper rings! Offering a fun, bright yellow color, add visual appeal to your dishes while providing the age-old distinctive flavor of banana peppers that's sure to satisfy your guests. Conveniently pre-sliced into bite-size rings, these banana peppers make the perfect toppings for refreshing salads or hearty subs and sandwiches, while delivering just the right amount of heat! "These are fresh crisp peppers right out of the bottle. We love the excellent flavor and the A+ quality. We will definitely be buying more of these!" 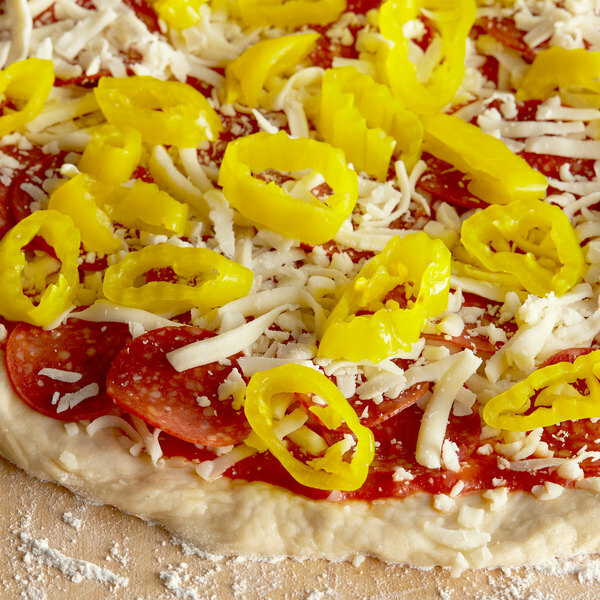 Adding a flavorful kick to meats, poultry, and vegetarian dishes alike, try topping hot dogs or crispy pizzas with banana pepper rings. Or, entice your customers by offering these banana peppers with smoky barbequed pork or steak sandwiches. They're also great on popular favorites like nachos or taco salads. These hot banana peppers are picked at the peak of freshness to ensure quality product and crisp, natural taste. Packed in water and salt to maintain texture, freshness, and natural spice, each pepper is pre-sliced into rings to save valuable kitchen prep time and to increase increase quick, efficient service to your guests! Regal Foods offers an extensive selection of marinades, cooking sauces, whole spices, canned vegetables, and many other kitchen essentials. Delivering quality and value, Regal Foods offers products that kick the taste of your food to the next level! Simply the best we love the product and will be ordering more for our clients. They simply rave and appreciate the fast processing and shipping. Customer service is great too. Just the right amount of heat, a little bit salty but pairs great with salads, pizza, and other food. Would buy them again, great deal! 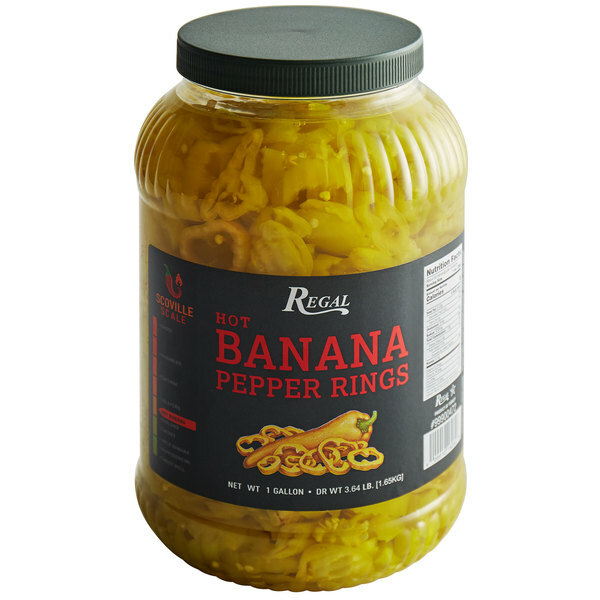 I love the zesty flavor of these hot banana pepper rings from Regal Foods. They are a superb quality and really nice for adding to our calzones. Some very spicy and crunch banana pepper rings that are great for adding to pizza. They are a really nice quality and have excellent flavor. I love these peppers! I always used to obsess over them at Subway and now I have them in my very own refrigerator! I love putting them on salads, turkey sandwhiches, and eating them by themselves. Take note; if you buy in the case and combine with other items to keep shipping costs spread out, these end up being cheaper than any major supplier offers. Great hot banana pepper slices! These are slightly hot and still crisp for sandwiches or salads or whatever you like a bit of spice on. They are quite salty, but once drained you can rinse them if you prefer less sodium as we do. These are fresh crisp peppers right out of the bottle. We love the excellent flavor and the A+ quality. We will definitely be buying more of these! These are like the mild banana pepper rings but with an extra kick for those who like it hot. They are good in Mexican dishes and as a pizza topping. 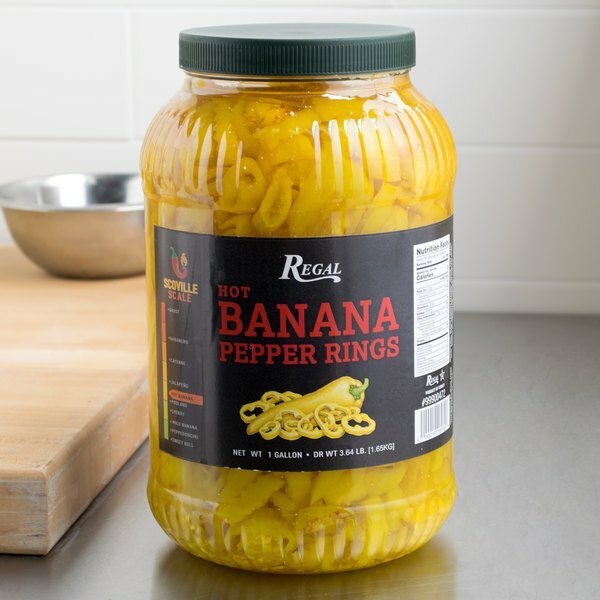 I purchase these hot banana pepper rings and my jalapenos through this website for a fraction of the cost I was ordering through my food company. I will continue to purchase. 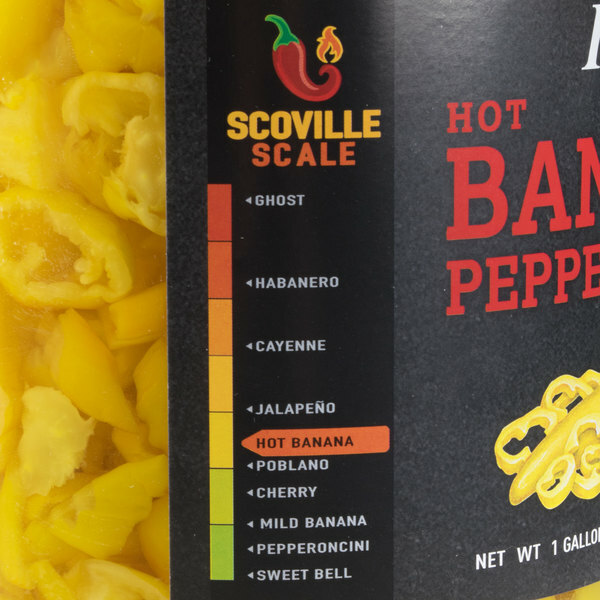 Ordering these was a great idea because we love banana peppers and I actually froze about half of these for later use with things like chili and pizza. I froze them in a seal o meal bags and this actually worked really well. These tasted really good! These are essential side item for any deli/sandwich shop. This is a lot of peppers for the price. Nice bright color and just enough heat to compliment foods without overpowering them. Try them on a salad to add a little more zing! I just started using these. They are really awesome and not broken up in pieces like I purchased from other places in the past. I will reorder again as they are perfect in my sandwiches and salads. Great flavor too! These are so yummy! I was very surprised on how much were actually inside the jar. Good deal for me I love them, I'm always buying from here. Love these peppers! They kind of go with everything besides deserts lol. Great with sandwiches, salads, on pizza, with sausages, amazing stuff in this jar! I have always preferred jarred peppers as opposed to canned ones. There is a certain crispness and flavor that can't be found with canned ones. This product is a great addition to almost any sandwich! These banana peppers go great on any Italian sandwhich combos! The taste is uncomparable! They are not too spicy, but the add the acidity that every sandwich needs! Great buy! I actually use the Banana Pepper rings in a little bit different of a way then just placing them on submarines and salads. I deep fry the pepper rings and they are delicious dipped in Ranch. These peppers offer the perfect amount of heat. Good topper for many different sandwiches, subs, hot dogs, and salads. I sometimes use it for my rattle snake pasta. These peppers are great for subs and sandwiches!! Nice large size is sure to last!! Good for stir fry and even adding to sauces to add a touch of heat!!! I use the hot banana pepper rings with my sandwiches because they are much better tasting than the regular plain green/red/yellow peppers. The hot banana peppers are a bit spicey, but not too spicey that you need water. They add a tang to the sandwiches that a lot of people enjoy. These banana peppers in a 1-gallon container is an excellent value for anyone who is into the hot banana peppers.